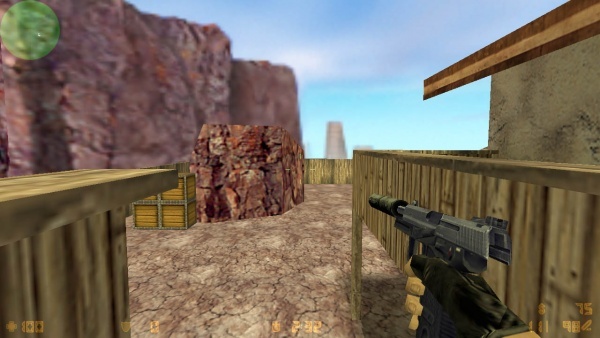 ''Note'': Many of the weapons in ''Counter-Strike'' have correct models in third-person view, but are flipped in right-handed first-person view, causing features like the ejection port, mag release, forward assist, and brass deflector to be placed on the wrong side of the receiver. 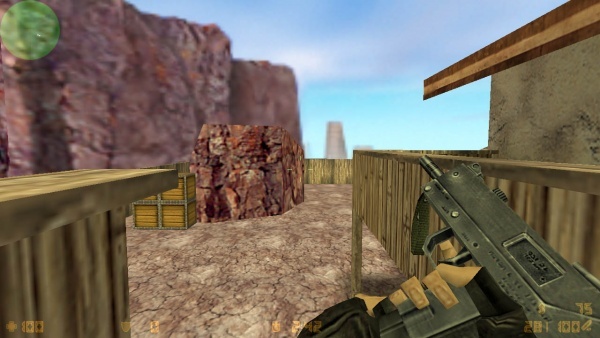 This is because the weapon animator was left-handed, and initially animated the right-handed weapons with left-handed operation in first person view, which were later simply flipped for right handed players. 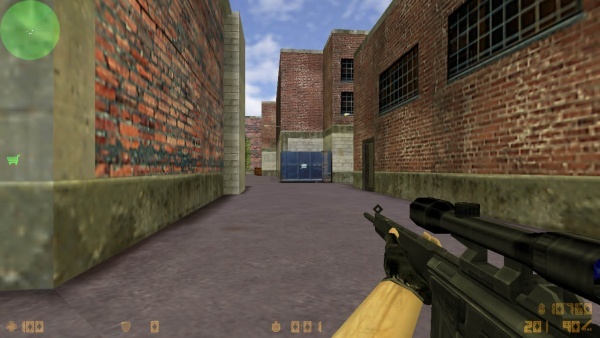 ''Note 1'': Many of the weapons in ''Counter-Strike'' have correct models in third-person view, but are flipped in right-handed first-person view, causing features like the ejection port, mag release, forward assist, and brass deflector to be placed on the wrong side of the receiver. 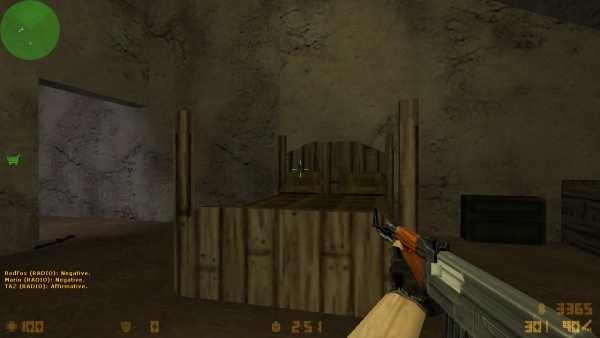 This is because the weapon animator was left-handed, and initially animated the right-handed weapons with left-handed operation in first person view, which were later simply flipped for right handed players. 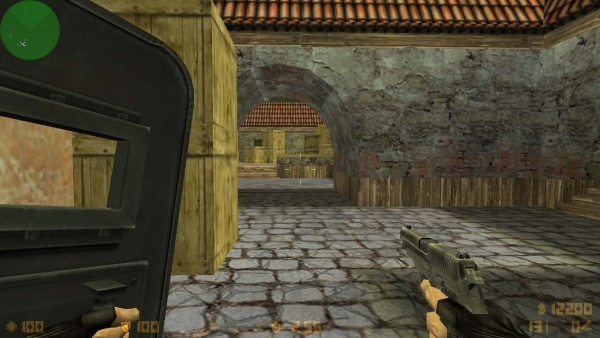 ''Note 2'': The official retail version of the game features fictional weapon names such as "CV-47". However, some older mod versions features real weapon names. This page primarily covers the retail version of the game. 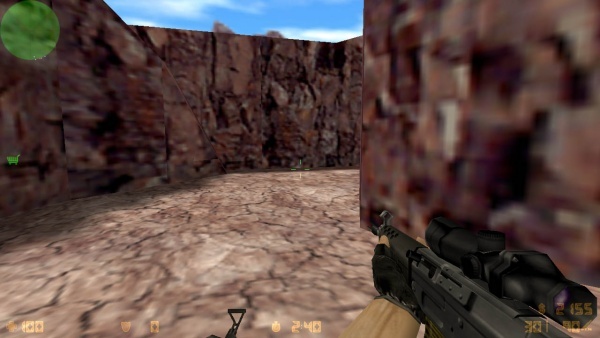 Note 1: Many of the weapons in Counter-Strike have correct models in third-person view, but are flipped in right-handed first-person view, causing features like the ejection port, mag release, forward assist, and brass deflector to be placed on the wrong side of the receiver. This is because the weapon animator was left-handed, and initially animated the right-handed weapons with left-handed operation in first person view, which were later simply flipped for right handed players. 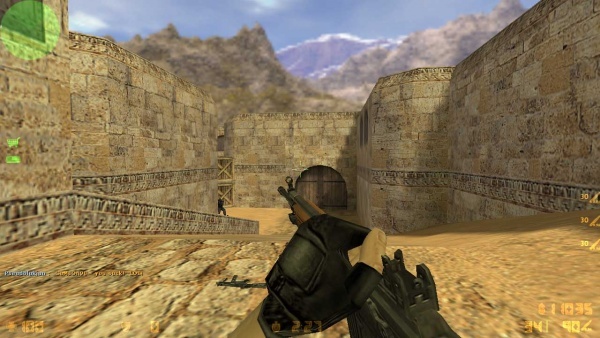 Note 2: The official retail version of the game features fictional weapon names such as "CV-47". However, some older mod versions features real weapon names. This page primarily covers the retail version of the game. Called the "9x19mm Sidearm" in-game. 2nd Gen Glock 17C's are the starting weapon for the Terrorist faction. It has semi-automatic and (incorrect) 3-round burst firing modes, and an incorrect 20-round magazine capacity (in reality this would only be achievable with a 19-round magazine and an extra round in the chamber). 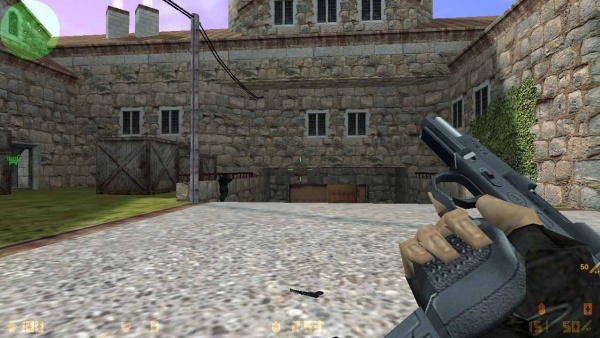 A Terrorist holding a Glock 17C on cs_militia. It is identified as C model by the two compensator cuts on the slide near the front sight. Called the "K&M 45 Tactical Pistol" in-game. The Heckler & Koch USP45 Tactical possesses a stainless steel slide and odd overall blue tint. 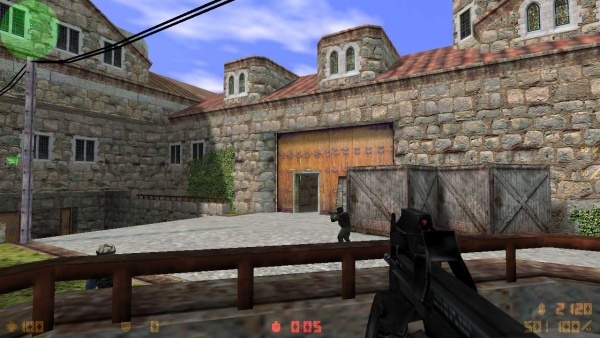 It serves as the starting weapon of the Counter-Terrorists. It comes with a detachable sound suppressor. 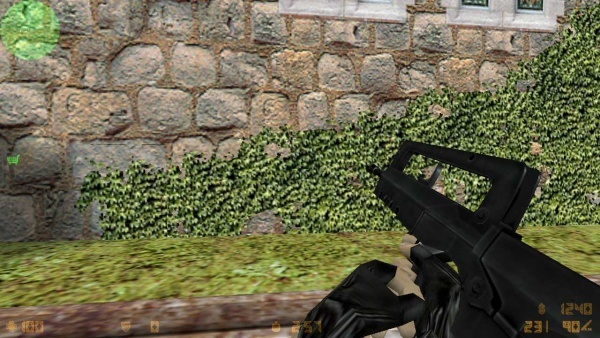 The Heckler & Koch USP45 Tactical in a Counter-Terrorist's hands. Reloading the suppressed USP45 Tactical. Called the "228 Compact" in-game. 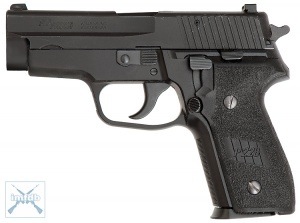 It is a SIG-Sauer P228 incorrectly chambered in .357 SIG. The P228 was never designed to handle the hotter .357 SIG round do to its lighter weight cast slide that could only take the higher pressure rounds if an overly heavy spring were installed. The .357 SIG round was first introduced with the SIG-Sauer P229 which had a different heavier CNC machined steel slide that could take the high velocity return with a standard spring and not damage the pistol. It also holds 13 rounds as if it's still in the proper 9x19mm chambering even though it should hold 12 rounds if it was actually a P229 chambered in .357 SIG. 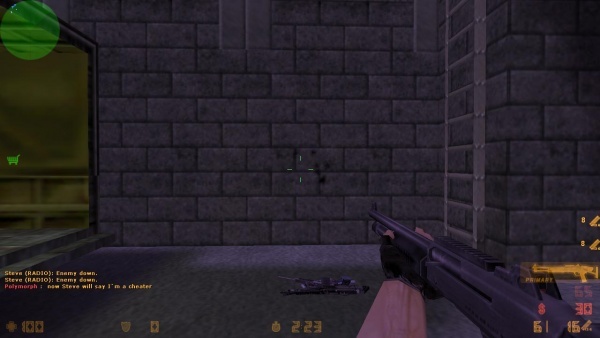 Holding a SIG-Sauer P228 on cs_militia. 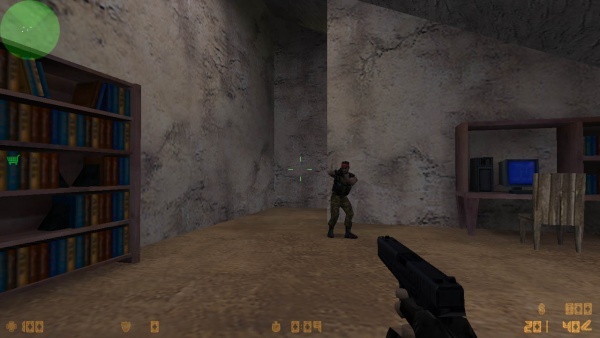 Wielding a P228 in conjunction with the tactical shield on de_inferno. Note that the hammer is now down for some reason. Named the "Nighthawk .50 C" in-game. 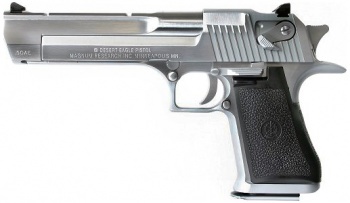 It can be identified as the Mark XIX version of the Desert Eagle because of the weaver rail over the barrel and the taller cocking serrations on the slide. It correctly holds 7 rounds of .50 Action Express. 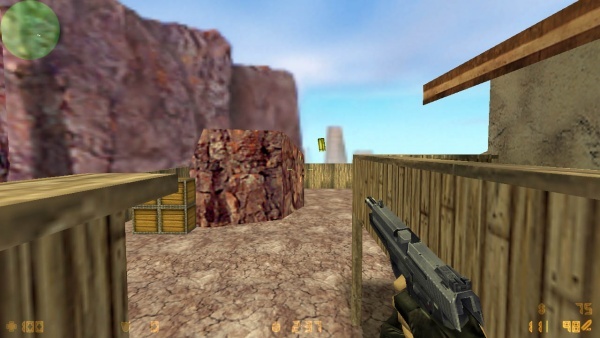 Counter-Stike is the game that coined the ever popular nickname "Deagle" for the Desert Eagle. 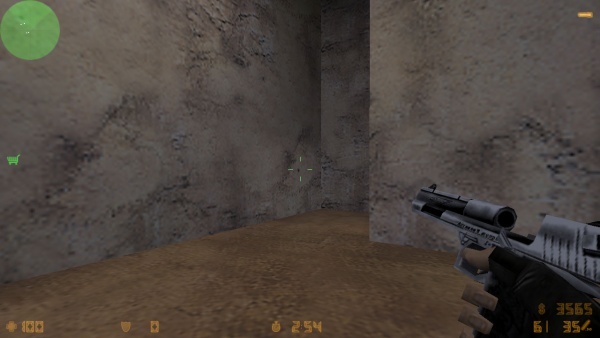 Holding the Desert Eagle on cs_militia. Note the rear target sight and the backwards slide release and front sight. Reloading the Desert Eagle. Here you can see an eagle head on the barrel and that the backwards slide release is raised way too far up when the slide locks back. Named the "ES Five-Seven" in-game. 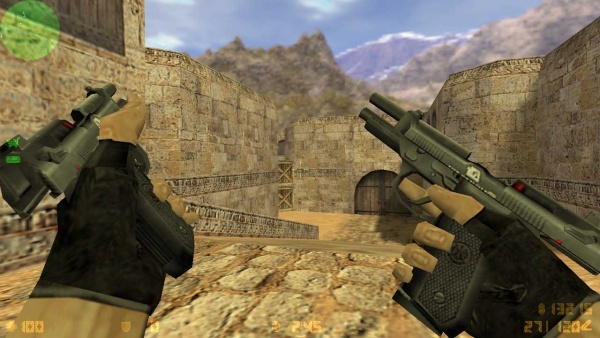 The FN Five-seveN is exclusive to the Counter-Terrorists. 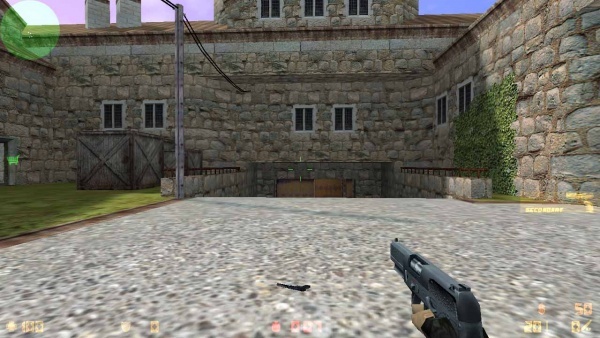 The FN Five-seveN on de_ccble. 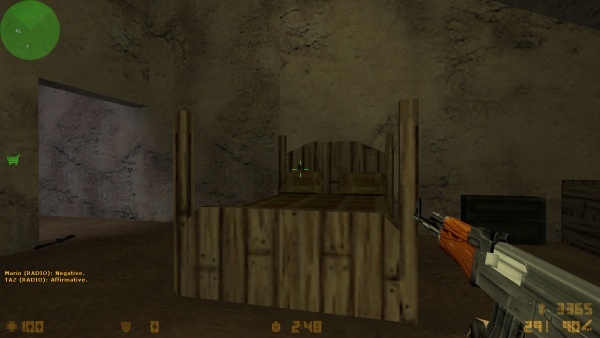 A Counter-Terrorist racks the slide during the draw animation. 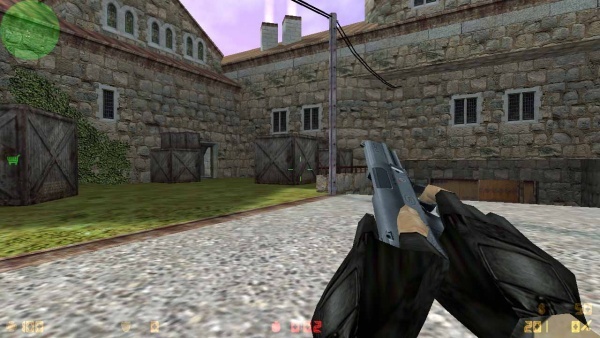 The Beretta 92G Elite II is the only dual-wielded weapon in the game and incorrectly has an all-black finish. Called the ".40 Dual Elite", it is a Terrorist exclusive weapon(s). 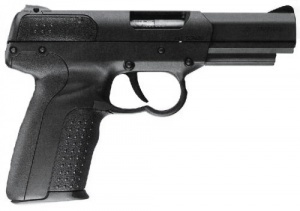 Although its name would imply it's a 96G Elite II model chambered in .40 S&W, each pistol holds 15 rounds like the 92G Elite II in 9x19mm for a total of 30 rounds, as where the .40 S&W model would hold 11 rounds in the standard magazines shown for a total of 22 rounds. 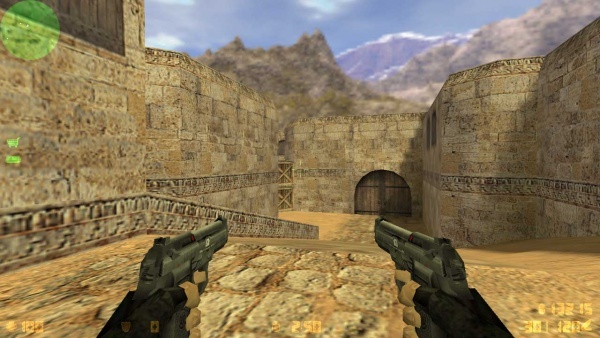 Holding the dual Beretta 92G Elite IIs on de_dust2. 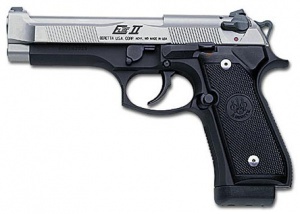 Reloading the Beretta 92G Elite IIs. 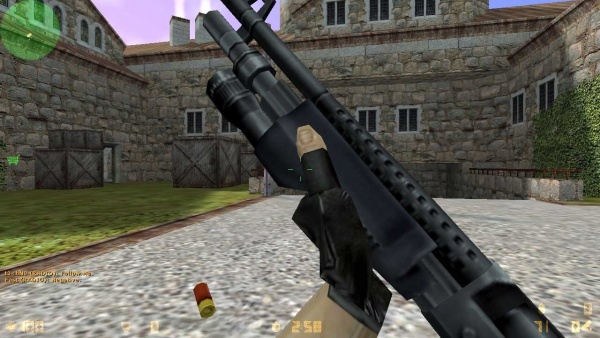 Dubbed the "Leone 12 Gauge Super", The Benelli M3 Super 90 in-game is fitted with a fictional dedicated weaponlight fore-end and heat-shield. 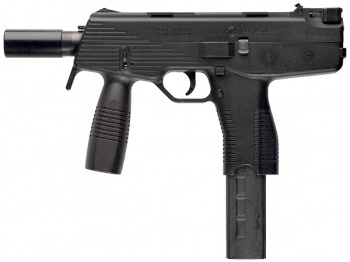 It holds 8 rounds, despite being modeled with the shorter 5-round tube magazine. 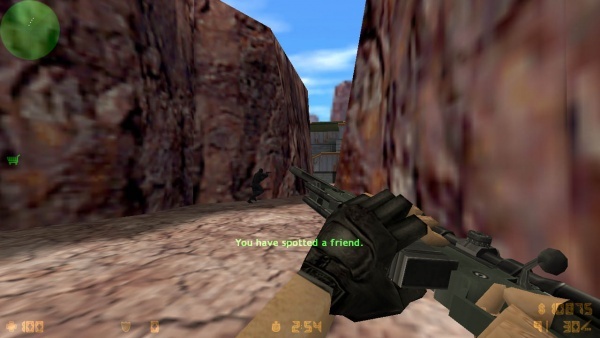 A Benelli M3 in the hands of a CT on de_cbble. Note the HK rear sight instead of the more familiar LPA Italy sight shown in later game installments. Close-up of the pump-action. Sadly, this cool dedicated weaponlight fore-end does not exist in real life for Benelli M3s nor does the heat shield. The Benelli M4 Super 90 appears as the "Leone YG1264 Auto Shotgun" / "XM1014". It correctly holds 7 rounds. 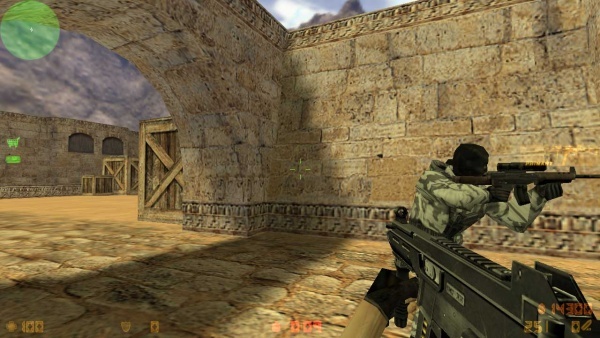 Holding a Benelli M4 on cs_assault. 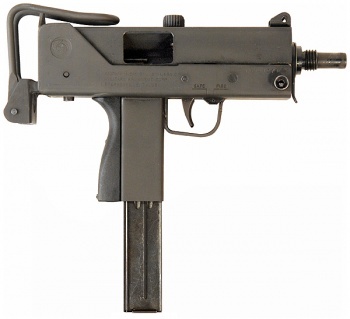 Called the "Schmidt Machine Pistol". 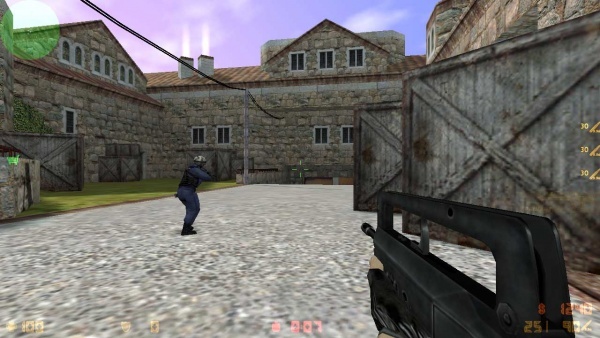 The Steyr TMP is exclusive to the Counter-Terrorists. It comes with a non-detachable suppressor. 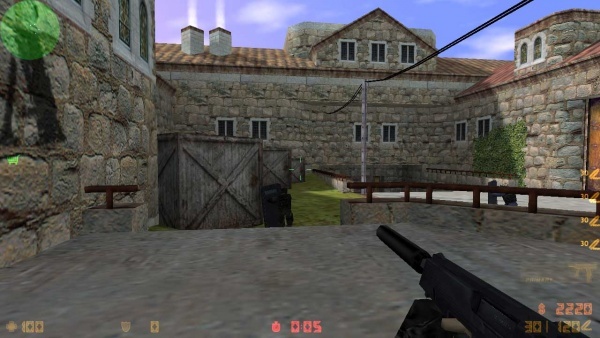 The Steyr TMP on de_cbble. Inserting a new magazine into the TMP. 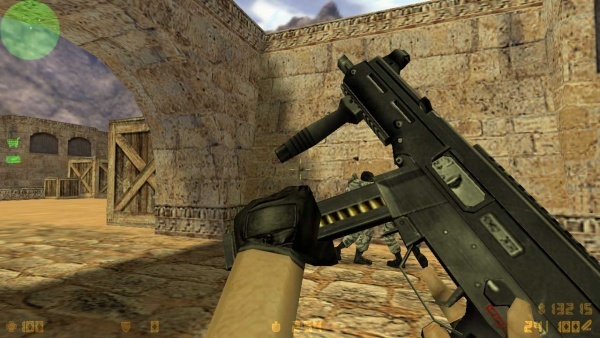 The MAC-10 retains its name because the company holding the rights to the name went bankrupt. Exclusive to the Terrorist faction. 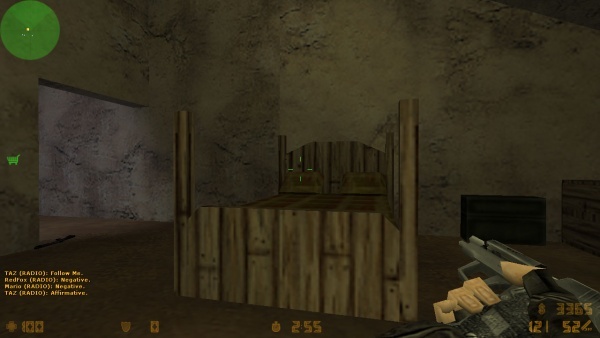 The model is erroneously shown as a closed-bolt weapon. 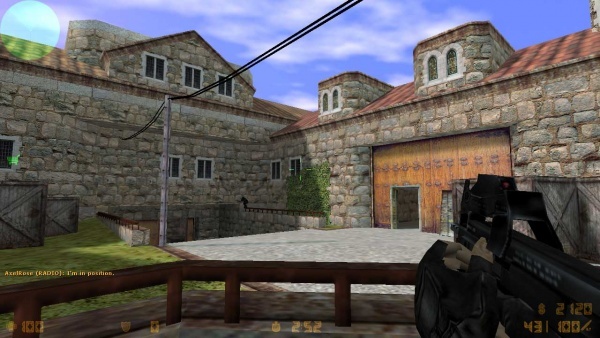 A Terrorist holding a MAC-10 on cs_militia. 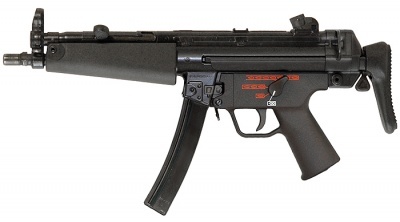 The Heckler & Koch MP5A5 appears as the "K&M Submachine Gun" in-game. 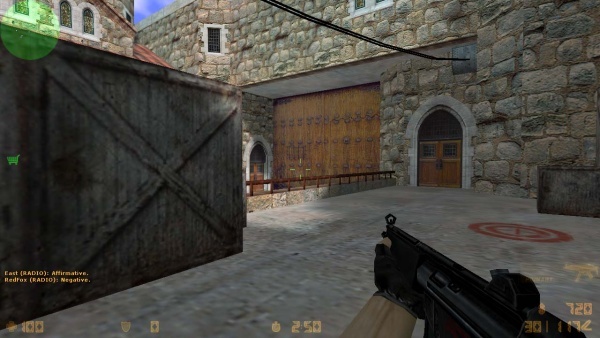 Holding the MP5A5 on de_cbble. Pulling the charging handle. Note how the hand clips right through the fore-end. 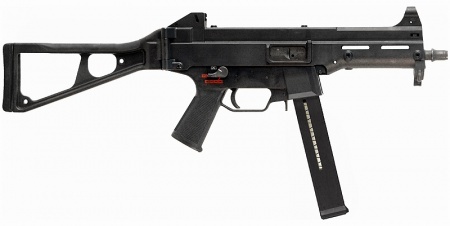 The Heckler & Koch UMP45 appears as the "KM UMP45" in the game. The charging handle incorrectly locks back on its own before reloading. It correctly holds 25 rounds. 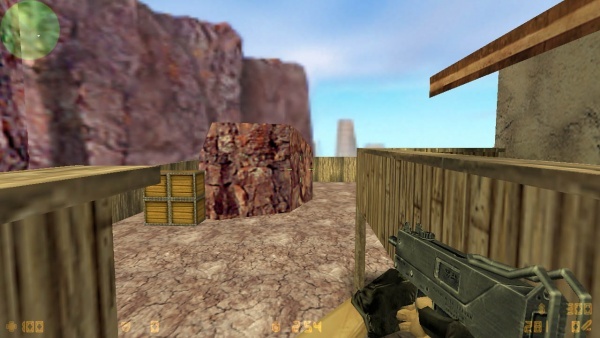 A Heckler & Koch UMP45 on de_dust2. Inserting a new magazine into the UMP45. 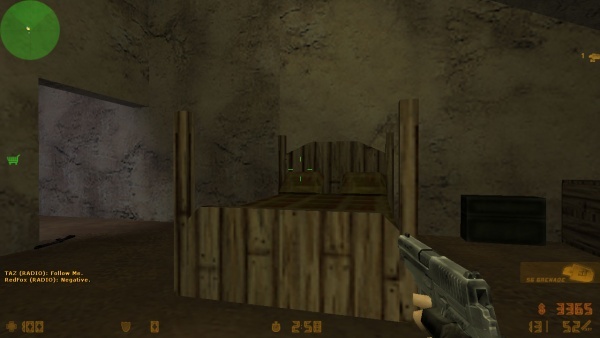 Note the closed bolt despite the bolt handle being in the locked open position, a trait shared with all (averted with Global Offensive) games in the series. 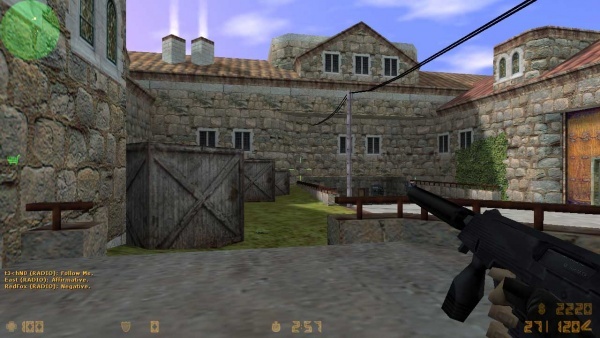 The FN P90 is called the "ES C90" in-game. 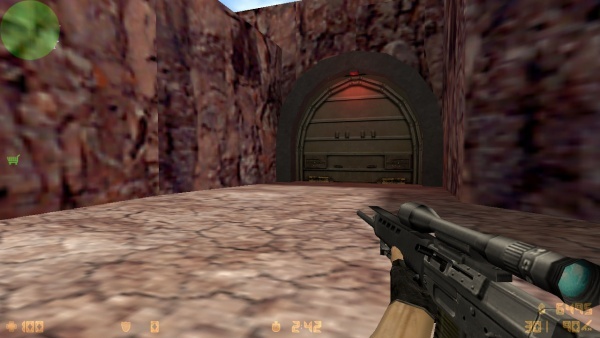 The FN P90 on de_cbble. Pulling the charging handle on the FN P90. 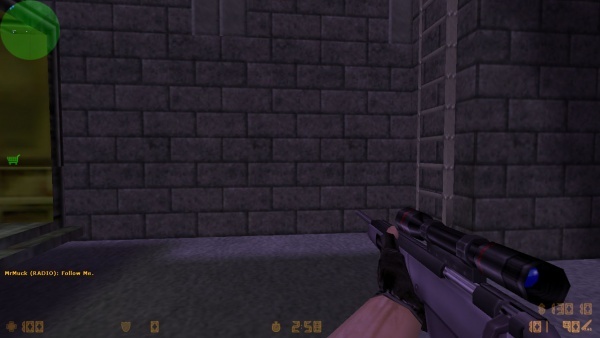 The FAMAS F1 is dubbed the "Clarion 5.56". 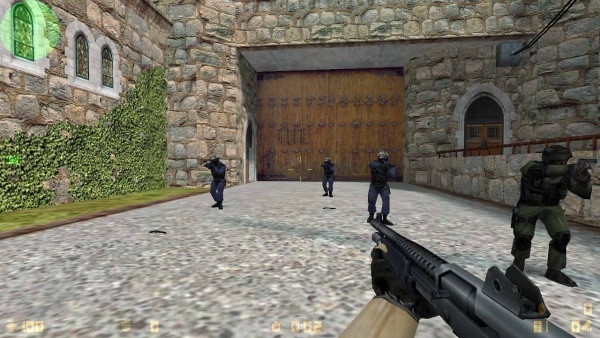 A exclusive primary weapon for the Counter-Terrorists. 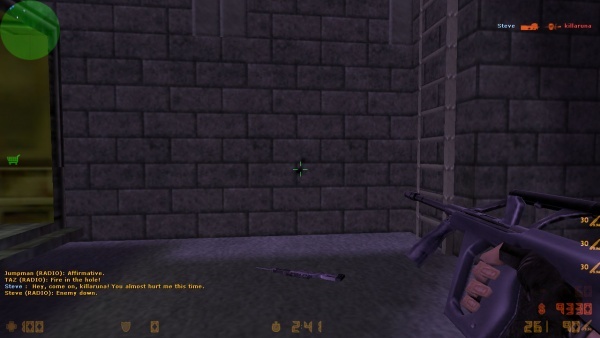 Holding a FAMAS F1 shortly before the round begins. 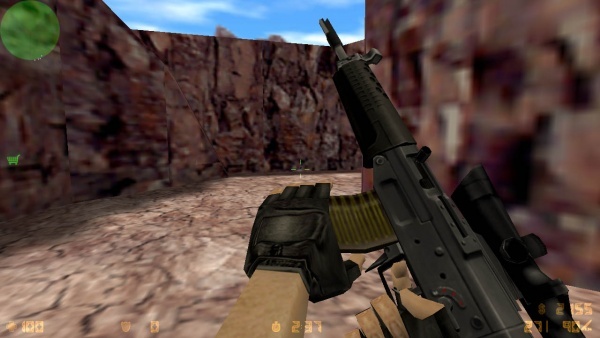 The IMI Galil ARM appears as the "IDF Defender" in-game, and is only available to the Terrorists. It is modeled after the 7.62x51mm NATO version, but has the 35-round capacity of the 5.56x45mm variant and is stated in-game to be chambered after this latter caliber. 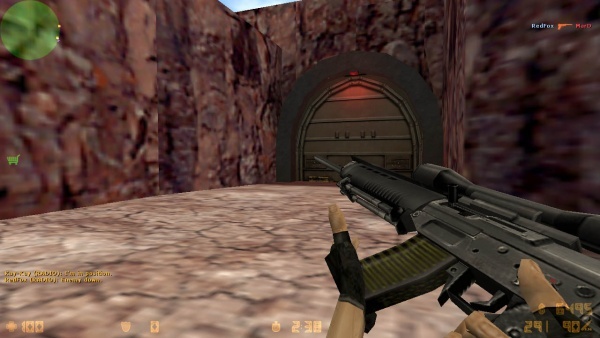 A Galil ARM on de_dust2. Pulling the bolt handle during reload. 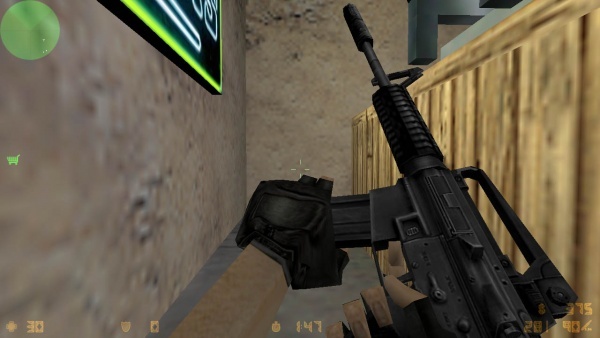 The Colt M4A1 is called the "Maverick M4A1 Carbine" in-game and is only available to the Counter-Terrorists. It comes with a a detachable suppressor. The player character will chamber it by pulling the forward assist instead of the charging handle. The Colt M4A1 Carbine with its suppressor attached. 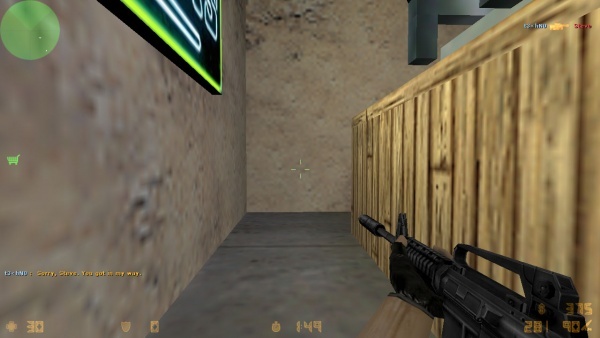 A CT attaching the M4A1´s suppressor on cs_office. 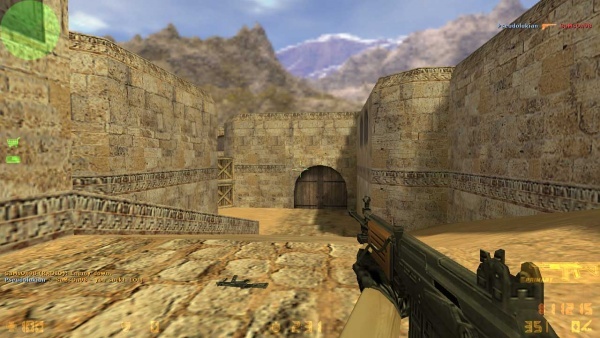 The AK-47 is called the "CV-47" in-game and is only available to the Terrorists. 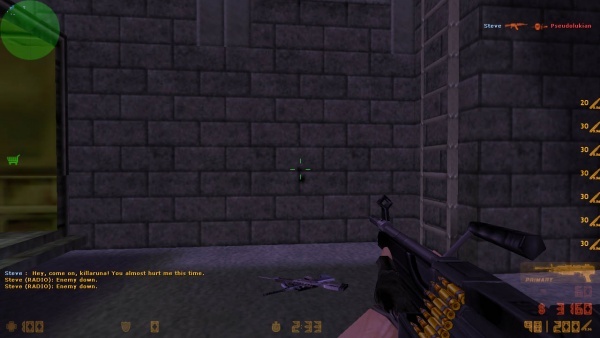 Holding the AK-47 on cs_militia. The Steyr AUG A1 is simply named the "Bullpup". 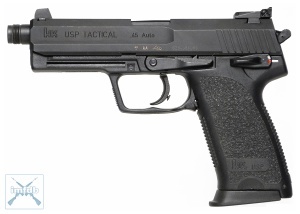 It is fitted with a gray stock and like the USP45 Tactical, it has an odd blue tint. 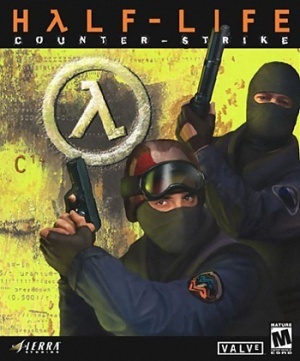 Only available to the Counter-Terrorists. 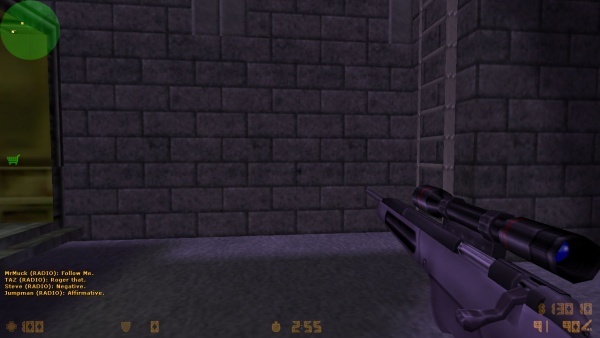 The Steyr AUG A1 on cs_assault. 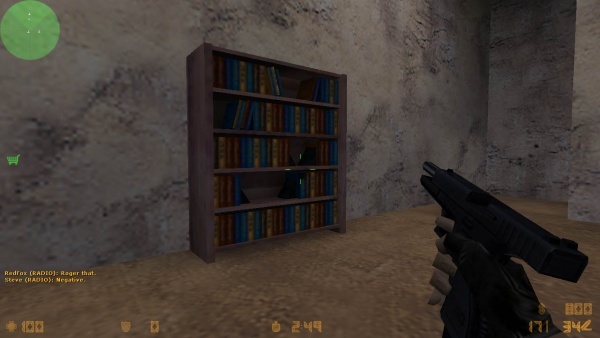 A CT inserts a new magazine during a reload. The SIG SG 552 is named the "Krieg 552" in the game. Only available to the Terrorists. It is fitted with a scope to bring it on par with the CT's AUG A1. It incorrectly holds 30 rounds in a 20-round magazine. 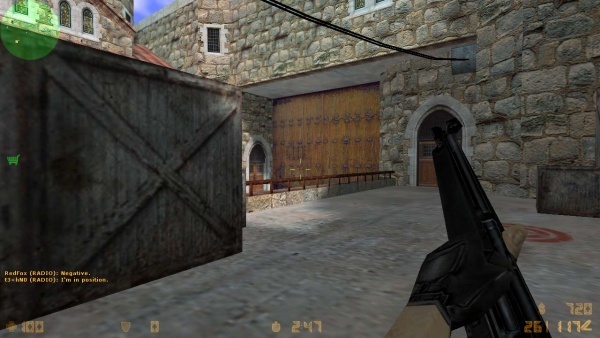 A Terrorist holding a SIG SG 552 on de_nuke. 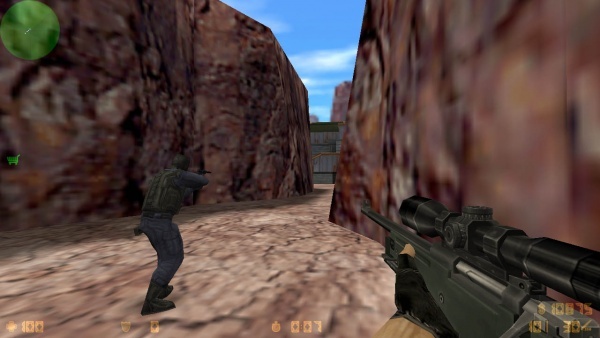 The Steyr Scout is called the "Schmidt Scout" in-game. It has a Steyr made extended magwell module and correctly holds 10 rounds. 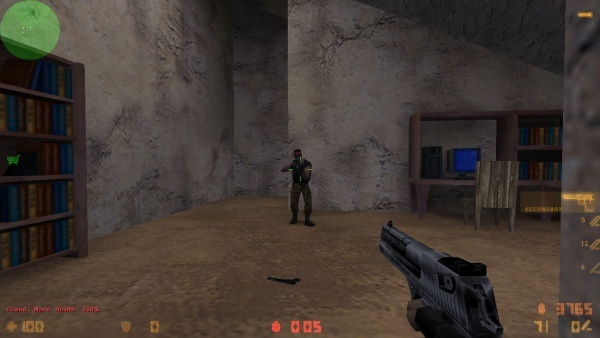 A Steyr Scout held on cs_assault. The Scout without a magazine inserted during reload. Note 10-round magwell. The Arctic Warfare Magnum appears as the "Magnum Sniper Rifle". It holds 10 rounds (like the original AW variant) but in reality the AWM/AWSM has a 5-round capacity. 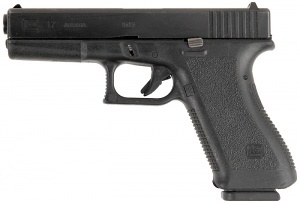 It is modeled with front sights from the G22. 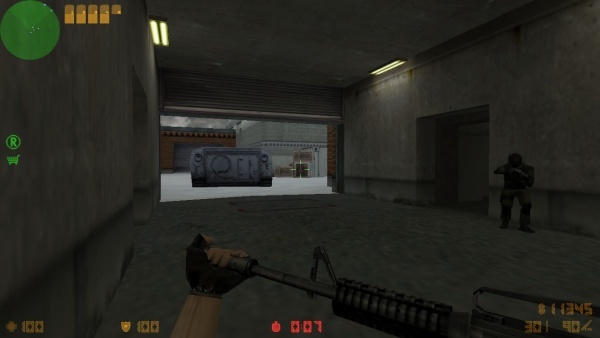 Holding a AWM at the Counter-Terrorist spawnpoint on de_nuke. Inserting a new magazine into the AWM. 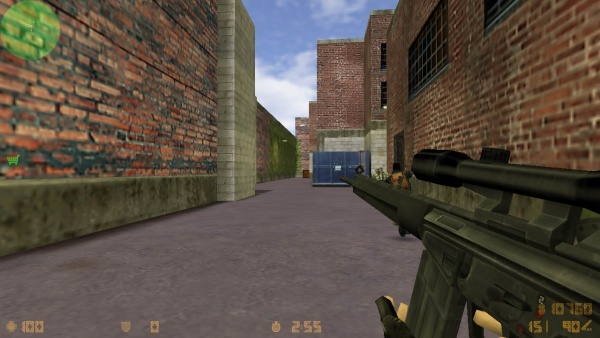 The SIG SG 550 Sniper is only available to the Counter-Terrorists and named the "Krieg 550 Commando". Like the SIG SG 552, it incorrectly holds 30 rounds in a 20-round magazine. 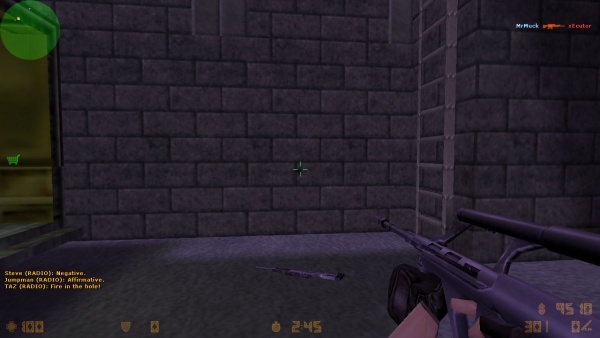 Holding the SG 550 Sniper on de_nuke. Smacking a new magazine into the SG 550 Sniper. The Heckler & Koch G3SG/1 is referred to as the "D3/AU-1" by the game and has an odd green tint. It can only be bought by the Terrorist faction. 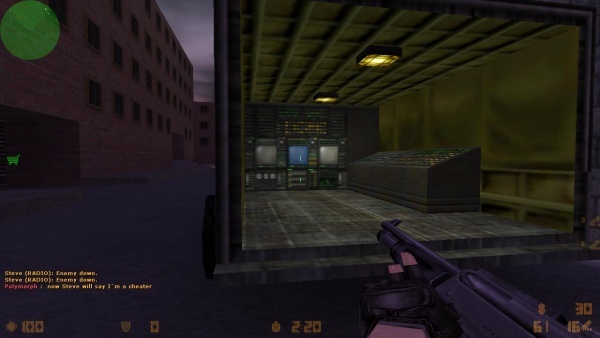 Wielding the G3SG/1 on de_train. The FN M249 SAW Para retains its name as the "M249". It is the only available machine gun and among the most expensive weapons in the game. It lacks a stock, fires at an unrealistically slow rate of fire (600 RPM in comparison to 650-900 RPM in real life), and for some reason it uses a tiny feed cover that opens to the right. A M249 SAW Para on cs_assault. Closing the very unusual feed tray cover.